STC Biologics, Inc is a boutique turn-key CDMO located in Newton MA, USA that provides full CMC Services and Consulting to enable partners advance their biologic products from discovery to commercialization. STC was founded in 2009 and its team brings expertise in biologics drug development and global regulatory approvals from Genentech, Novartis, Shire, EMD Serono, Lonza, Alexion and Merrimack. 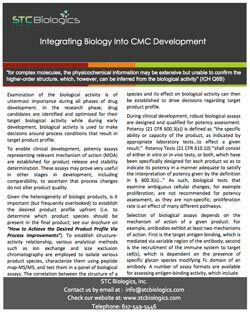 The holistic view of drug development with the integration of biology into CMC development, and the cross-training of its scientists in those diverse fields is what makes STC unique in its ability to expedite timelines to the clinic. STC strives to REALIZE “SPEED TO CLINIC” THROUGH INTEGRATED PRODUCT DEVELOPMENT, TECHNICAL RIGOR, AND FLEXIBILITY. STC has established its reputation as a flexible organization that clients can turn to for accelerated low cost programs through our Speed-To-Clinic Platform™, or for custom development when template processes don’t work. STC introduced Speed-To-Clinic Platform™ for MAbs starting from royalty free Cell Line Development directly to cGMP Manufacturing and released Drug Substance, all within only 12 months! 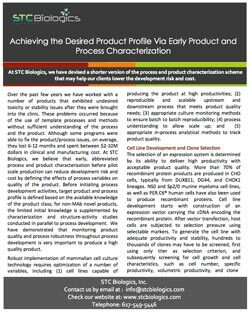 STC Biologics’ core competencies center on biologics drug development starting from cell line generation, process, analytical and formulation development to GMP production. 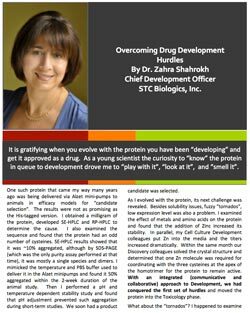 The technical and regulatory know-how at STC Biologics enables integrated product development planning and successful maneuvering through inevitable development challenges. 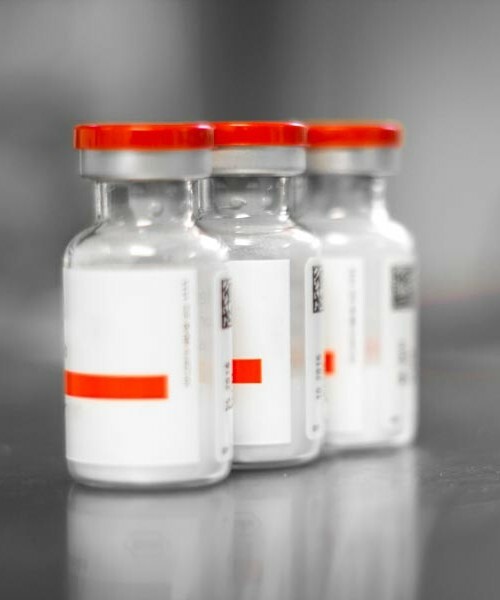 Having written over 8 BLAs, dozens of INDs, & 20 comparability protocols & supplemented by experience in the life cycle management of 5 approved biologics, our management team is uniquely positioned to guide our clients to develop an integrated CMC plan tied to preclinical & clinical development with an eye on regulatory expectations. During the last five years, we have advanced our first biosimilar product, STC101, from concept to clinical development in Europe under the EMA guidance. We have also helped our clients overcome complex process & analytical challenges through rigorous & customized efforts. With experience in all phases of product development for a range of biotherapeutics and commitment to advance the products through development, STC Biologics is your preferred strategic partner. We take pride in our ability to become an expert on your product, to go above and beyond in order to drive it through various stages of product development and ultimately successfully tell the story of your product in regulatory submissions. The time and cost savings of an integrated approach to developing products, not constrained by the boundaries of different departments, has been realized in smart cross-functional organizations. 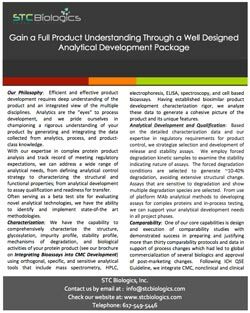 STC Biologics, Inc. is founded on such boundary-less merge of disciplines, as the knowledge of biology, process development, analytics, formulation, and regulatory sciences is in one team body. Our pride in technical rigor, perseverance, critical thinking, and multidisciplinary collaborative work ethics bring agile resolution to technical hurdles and nimble development of products. STC Biologics possesses more than 70 years of combined drug development experience with a focus on Oncology, Immune Diseases and Infectious Diseases. With our extensive knowledge in these disease areas we are confident in our ability to expedite your drug development by providing disease area specific CMC & regulatory expertise.